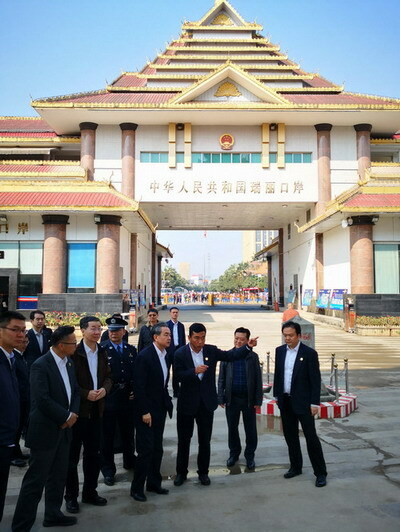 From February 16 to 18, 2019, State Councilor and Foreign Minister Wang Yi, during his inspection tour to China-Myanmar border in Yunnan Province, stressed to deeply implement the spirit of General Secretary Xi Jinping's important instructions, push forward China-Myanmar friendship, maintain the stability in China-Myanmar border, and promote the prosperity and development of border areas. Wang Yi inspected China-Myanmar border rivers and boundary posts, boundary facilities, Ruili port, China-Myanmar oil and gas pipeline project and the "One Village, Two Countries" border community, and he chaired a discussion to listen to the opinions and suggestions of grass-roots units and frontline workers. Wang Yi said that the China-Myanmar border is an important bond of the two countries' friendship. It is directly related to the security and stability of the southwestern border of China, and the cooperation process of the joint construction of the Belt and Road Initiative. He stressed that we should fully understand the importance of the work in the China-Myanmar border, further strengthen the overall planning and coordination with the Myanmar side and relevant domestic departments, and cooperate well in the border management to maintain clear and stable boundary lines. We should effectively maintain the border order to ensure the safety of people's lives and property in China's border areas. We should continue to provide support and assistance to Myanmar's internal peace process, strive to achieve long-term stability in the China-Myanmar border areas, and create a peaceful and friendly environment for the production and life of people in border areas of the two countries. We should will vigorously promote the construction of the China-Myanmar Economic Corridor and the China-Myanmar Border Economic Cooperation Zone, intensify exchanges and cooperation between the two countries' border areas, provide more convenience for personnel exchanges in border areas of the two countries, and serve the economic and social development of the two countries.